The spring thaw is upon us as temperatures creep up, days grow longer with golden sunshine, trees and grass change from brown to green, and the grill gets a much needed wipe down and polish. 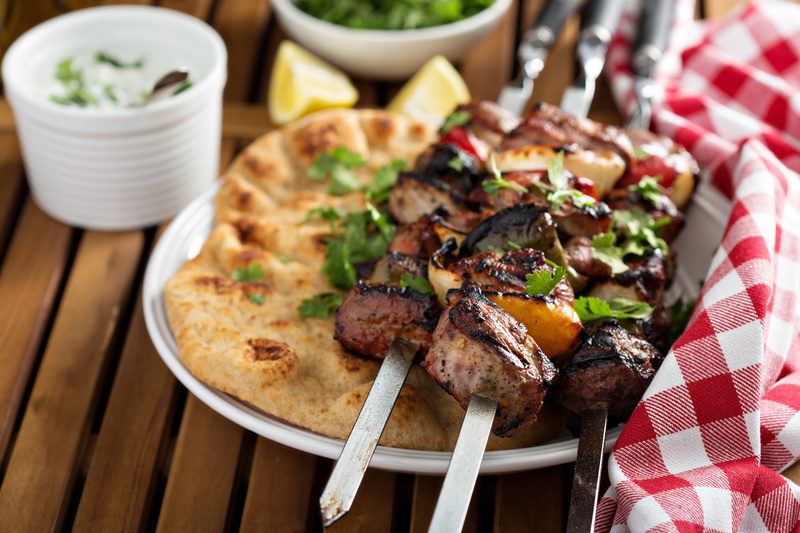 It’s time for Grillin’ in the Spring with Lamb Kebabs marinated in fresh Mediterranean flavors and served with a refreshing yogurt sauce. The leanness of the lamb combined with charred vegetables makes for a delicious and healthy meal. Begin preparing the marinade by combining olive oil, minced onion, oregano, red wine vinegar, garlic, salt, and pepper in a bowl, and then adding the cubed lamb to marinate for several hours. The yogurt sauce is a creamy, light, and citrusy mixture of grated cucumber, Greek yogurt, minced onion, lemon zest, lemon juice, garlic, salt, and pepper. Assemble the skewers with lamb, bell peppers, onion, and tomatoes, and grill over high heat basting with reserved marinade. Ready in just a couple minutes, serve with warm pita bread and yogurt sauce for a delightful noontime meal. So fire up the grill, pack away the winter wardrobe, and get ready for Grillin’ in the Spring. If you are using wood skewers, soak them for about 20 minutes before assembly. Mix the ingredients for the marinade. Skewer the meat and veggies, alternating the different ingredients. I prefer to start and end with meat on the skewers. Veggies tend to shrink away from the skewers during cooking, while meat tends to tighten up on the skewers, keeping the other ingredients in place. Put the skewered ingredients in a large glass baking dish or a heavy duty zipper plastic bags (freezer bags). If you use bags, make sure you don’t poke any holes with the skewers. Set aside about 1/3 of a cup of the marinade to use for basting. Cover and refrigerate this 1/3 cup marinade until ready to grill. Pour the rest of the marinade over the skewers. Cover (or zip) and refrigerate for 4 to 6 hours. Turn the kabobs in the marinade or spoon the marinade over the skewers a few times to ensure the kabobs gets lots of flavor. About 1/2 hour before grilling, remove the lamb kabobs from the refrigerator to let them come up to room temperature before grilling. Grill over direct high heat, about 2 minutes per side. Baste frequently with the reserve marinade. Be careful not to overcook. Lamb is best served medium rare. Serve with warm pita bread and yogurt sauce. Grate the cucumber on a cheese grater. Use a clean dishtowel or a very strong paper towel to wrap up the cucumber and twist and squeeze to remove the moisture. Add the ingredients and mix.